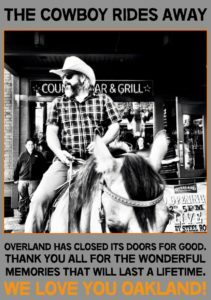 It’s official, Overland, at the foot of Broadway in Oakland, has closed. A few months ago, Paul Hayward, Overland’s owner/manager Overland, had expressed his concern to HWS that there were too few residential dwellings near Jack London Square to support live music. Something must be wrong, because over the decades a string of clubs have opened and closed in that area and very few have lasted as long as Overland (three years). Mitch Polzak & the Royal Deuces, Suzanne Wilde, Carolyn Sills, and Laura Benitez & the Heartache are among the twangin’ bands that have played Overland. But do not lose heart, Oakland, there are other signs of musical life springing up there. Stay tune to HWS for further developments. The SF’s Riptide, months after rebuilding from its fire, has brought back two of its regulars. Starting in October, Joe Goldmark and the Seducers will play every fourth Sunday from 7:30 to 10:30, and the popular Hootenanny West Side Review jam, hosted by Chris Ford/Jack Champion, is locked into second Sundays, also from 7:30 to 10:30. Find regularly scheduled Riptide shows and others on the HWS calendar of weekly and monthly events. This calendar is different from the regular HWS calendar which includes regularly and irregularly scheduled live music. The Weekly/Monthly Events calendar lists only regularly scheduled events, plus more jams, bluegrass and DJed events.